Philips and Targos, a global leader in clinical biomarker services, recently announced a joint initiative to enhance digital pathology education and help drive the global standardization of clinical biomarkers. Targos is embedding Philips Pathology Education Tutor , Philips’ pathology course and assessment creation platform, into its internationally renowned biomarker and immunology training for pathologists and oncologists. Philips’ Tutor software enables Targos to transform its traditional glass microscopy courses for HER2 and PD-L1 evaluation into a digital learning experience, expanding access to high-quality digital pathology training. Philips Tutor education software offers course participants high-resolution images and an innovative strategy for evaluation, which also enables them to further learn and evaluate training cases remotely after the training course. Together, Philips’ cloud-based platform will help Targos create engaging courses, training programs and assessments based on virtual slide images. Tutor is being used by learning institutions throughout Europe and the U.S. as labs start to move away from manual microscopy training, towards advanced education and e-learning programs using digital whole slide images. Replacing traditional glass slides with digital teaching formats enables institutions to conserve resources, while reaching broader learning audiences and creating a more standardized learning experience. 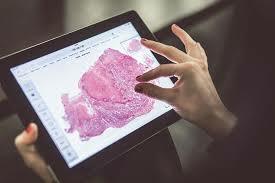 Through standardizing the experience, pathologists are able to review and share the same sets of clinical images and data, as well as directly compare and score test results and submitted annotations online. The collaboration comes as Philips unveils Tutor version 6.0, with advanced in-slide learning features. Lectures, courses and assessments that simulate diagnostic settings can be created where users submit annotations and quantitative answers to questions directly within the virtual microscope view. The latest version also allows users to immediately restore deleted content so that course creators never lose their work. Tutor is part of Philips’ portfolio of digital pathology solutions, which includes the award-winning Philips IntelliSite Pathology Solution, Collaboration Suite, TissueMark image analytics and more. Tutor is intended for educational purposes only, not for diagnostic use.